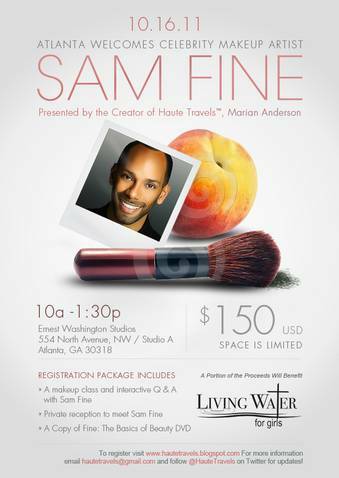 Home celebrity makeup Sam Fine Makeup Class in Atlanta! Guess what!?! Sam Fine is coming to Atlanta to teach a beauty class, eek! It's not too often that we have these types of events in the ATL so when you have an opportunity to go, jump on it. Sam Fine is an amazing Makeup Artist and a true inspiration. He's touched the faces of celebrities like Queen Latifah, Iman, Jennifer Hudson and countless others. I've had the pleasure of meeting him at the New York Makeup Show and via twitter and believe me, this is one man you'll definitely want to meet. I've already purchased my ticket and you should do the same! This event is also designed to raise awareness for Living Water for Girls. The organization provides safe refuge for young girls forced into prostitution. These beauty events are designed to raise awareness and remind the girls that no matter what has happened to them... they are beautiful! To register, visit www.hautetravels.blogspot.com for more details. Let me know if you're going in the comments below, i'd love to meet you all! I bought my ticket this evening! I can't wait!